Another in my series of ten year old photos. 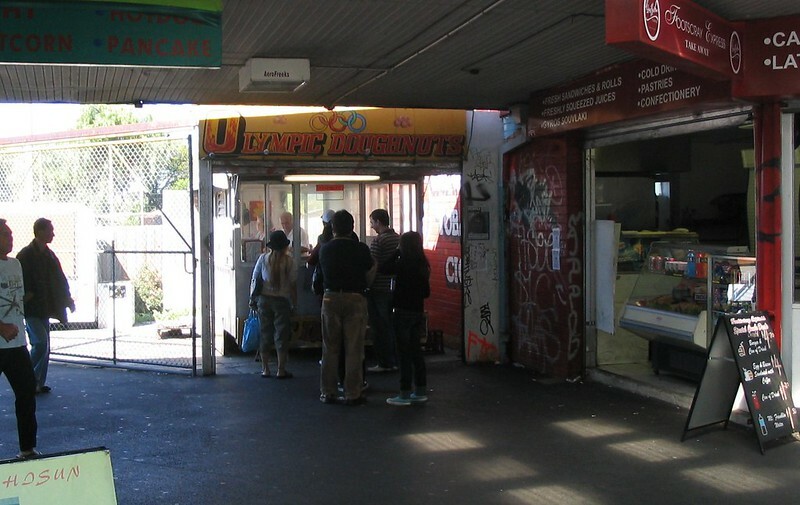 The old Olympic Doughnuts caravan, well before the shops along Irving Street were demolished to make way for additional station platforms. Footscray station snapped from the old (uncovered, ancient) overpass. This is platform 1, which has now become platform 3. 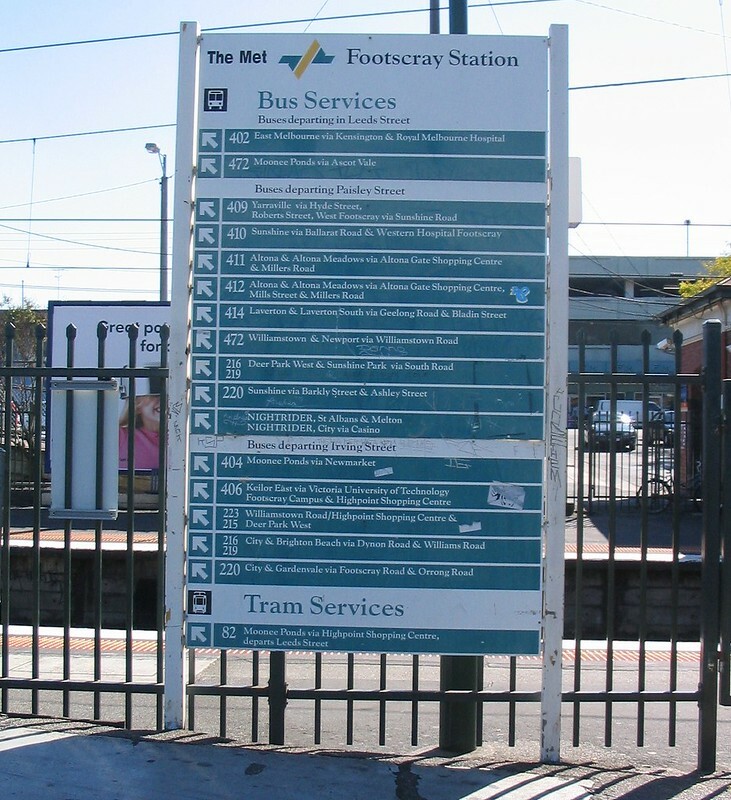 Despite The Met having been long since gone, this sign still survived as a guide to which buses departed Footscray from where. In summary: they’re all over there. Footscray bus interchange. It’s still pretty much the length of Paisley Street (a not-very-handy 3-5 minute walk from the station, whose major renovation a few years ago didn’t touch the bus stops). The biggest difference is that these days most of the buses are decorated in PTV orange. 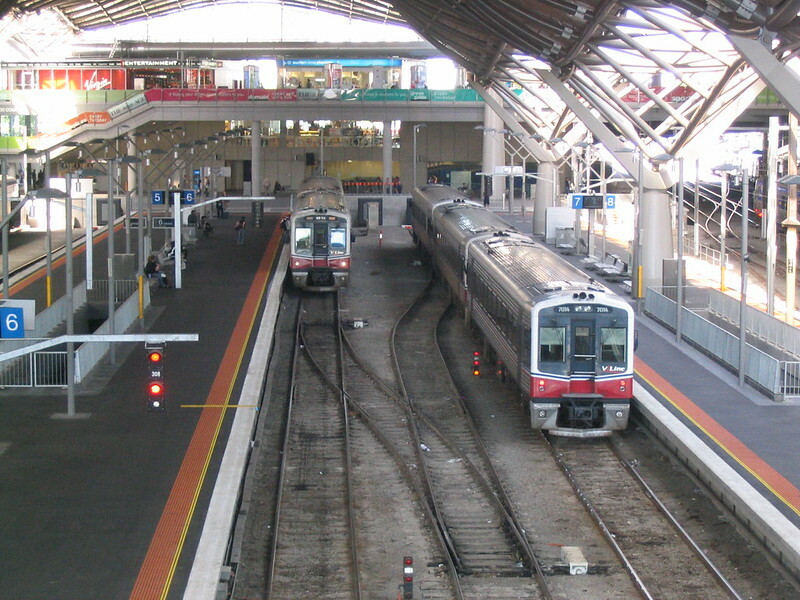 V/Line Sprinter trains at Southern Cross Station. 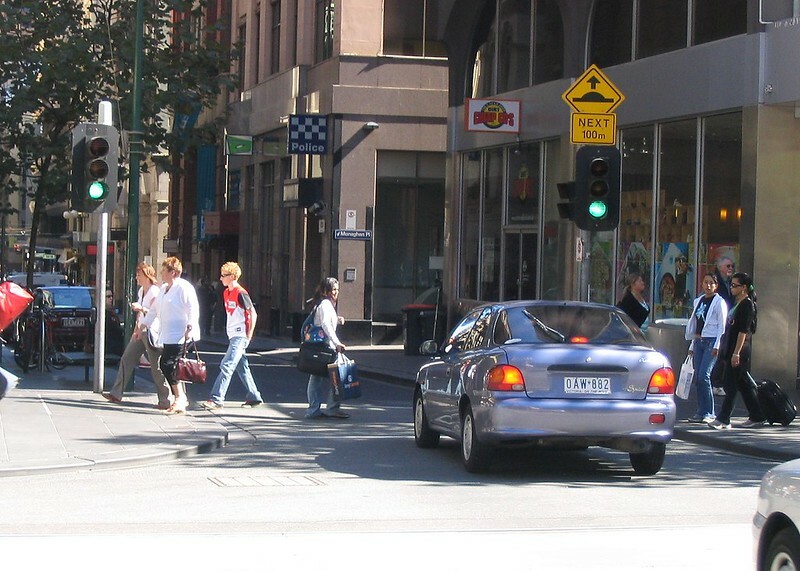 It might be hard to believe, but the old tram stop at Spencer and Bourke Streets was even worse than the one that’s there now. The exit was constricted (though only with barriers on one side, so at least people could spread out if there was no tram present). 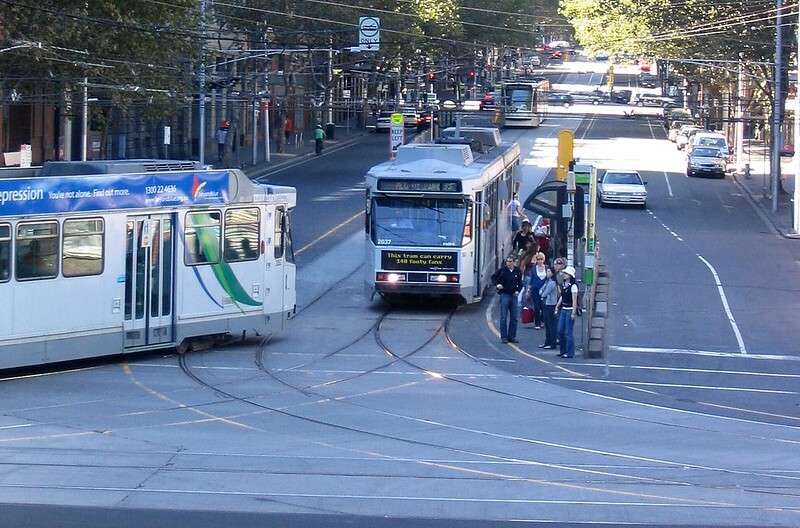 But no platform, virtually no shelter, and not enough capacity for more than one tram. 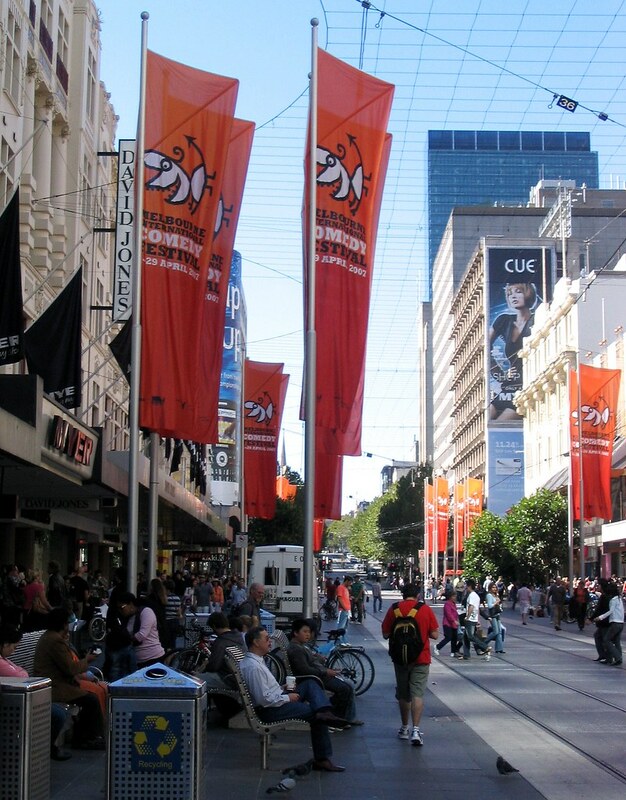 Bourke Street Mall during the Comedy Festival. I see there’s an Armaguard van parked there. Nothing changes. 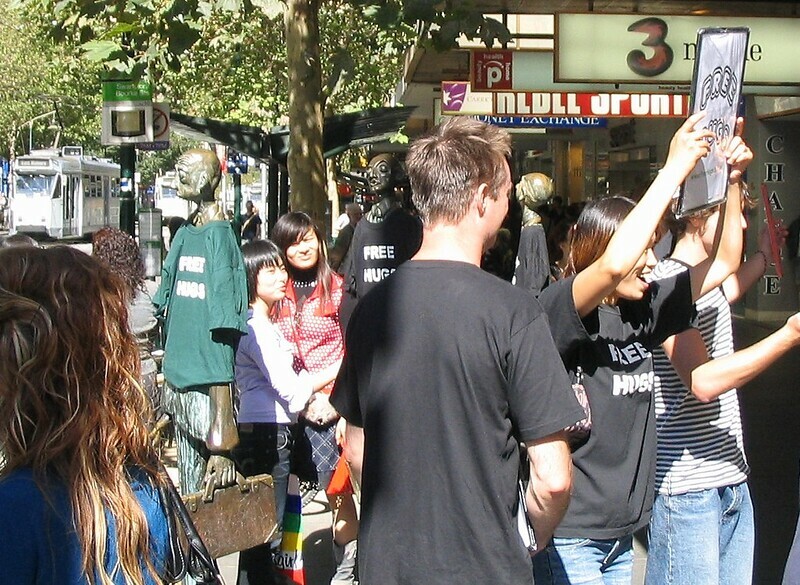 Free Hugs in Swanston Street. Does that still happen anymore? Note the “3 Mobile” shop sign — they merged with Vodafone in 2009. 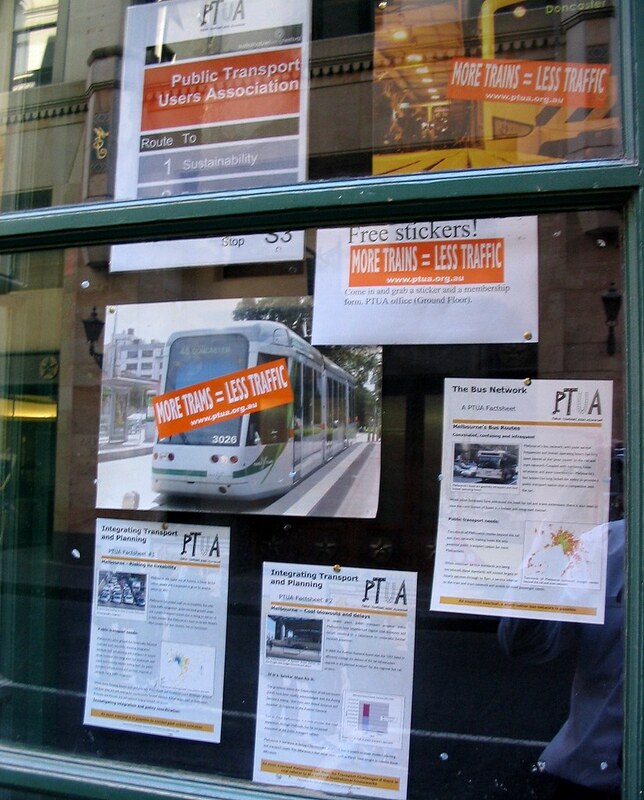 There’s also a tram Passenger Information Display — at the time, this was still the northbound tram stop. A walk along the river. Perhaps the skyline has changed a bit. “Evict Connex!” said the protest banners. I don’t think it worked, as Connex got their contract renewed in August 2007 until November-2009. 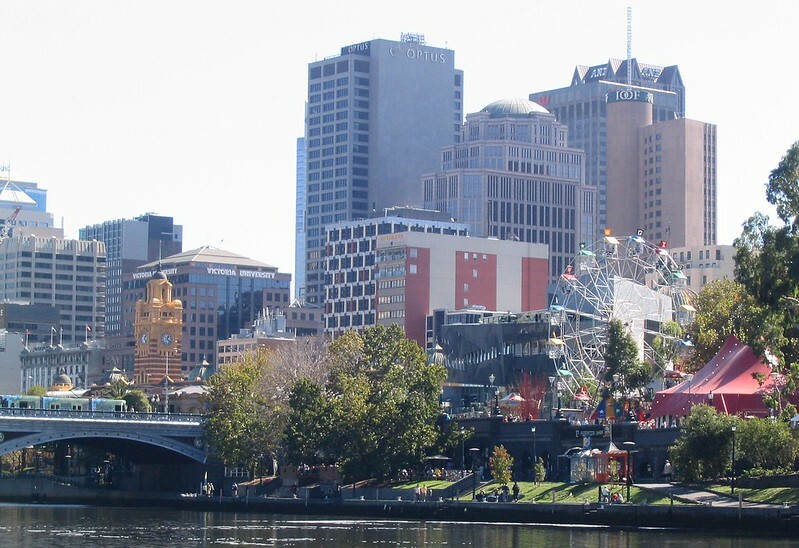 After that though, they got replaced by Metro Trains Melbourne. 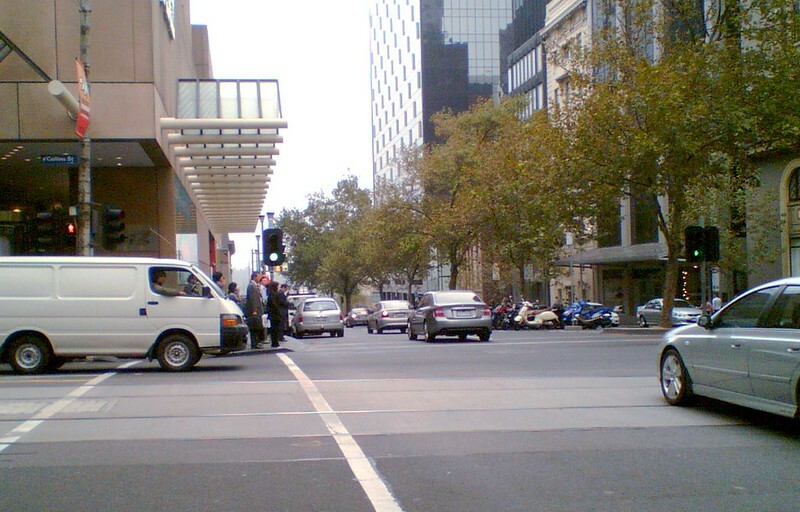 Yes, even back in 2007 I was narked off by motorists blocking pedestrian crossings. 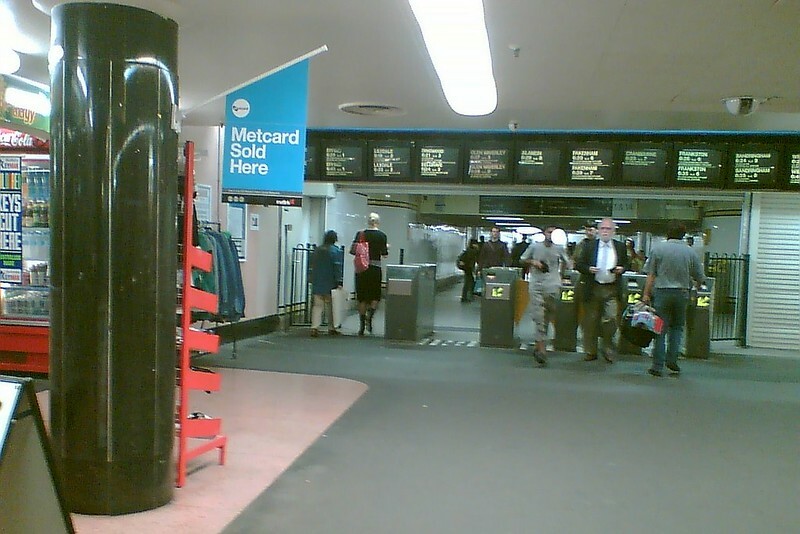 Finally, the fare gates in the Campbell Arcade underneath Flinders Street Station seemed to be left open a lot of the time. 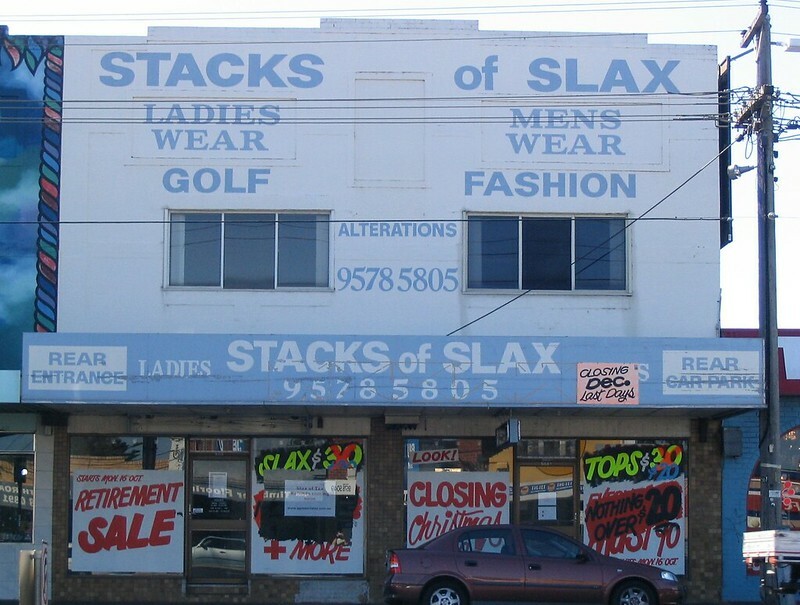 The year before, I’d documented it and turned it into a PTUA call for them to staff the gates properly, and a Herald Sun article based on that. Connex hadn’t listened, and continued to prefer to give fare evaders an easy time. Also notably, the number of gates hasn’t been increased despite crowding at peak times. 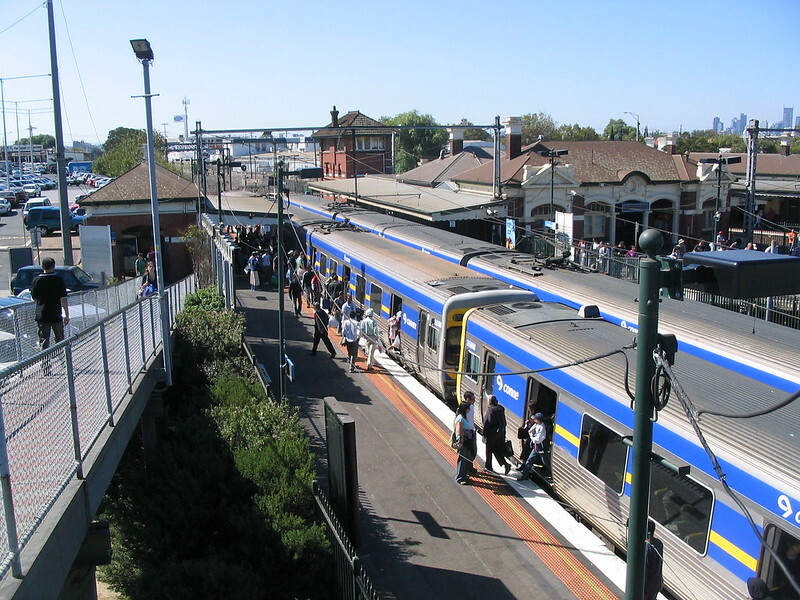 ← Previous Previous post: Why is the Night Bus stop for Bentleigh station not at Bentleigh station? Sadly, Olympic Doughnuts is no more, with Nick having to retire for health reasons last year. But such an institution that the RRL happened around him, and now immortalised in a Donutumentary (that’s a documentary about donuts). But you can still get donuts at Footscray station – the new operator of the space does donuts and coffee – or go to Cavallaros and get some canolli. 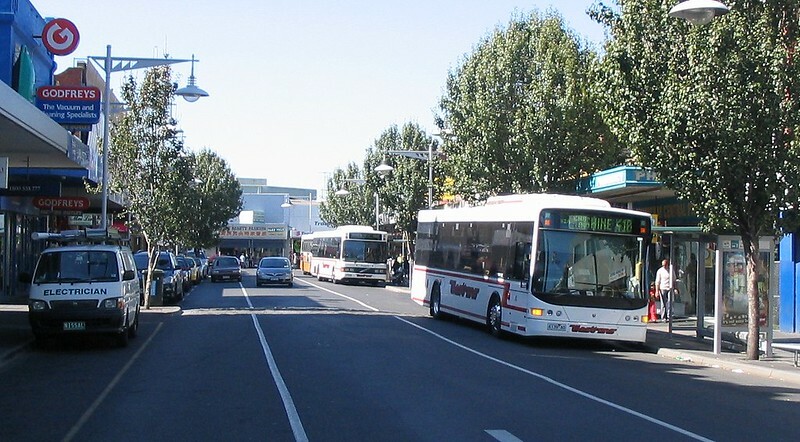 Re the bus interchange, probably not much that can be done about that, seeing as there really is no room next to the station for all the buses – maybe move the cab rank and have buses on both sides of Irving St. Ten years ago seems like such a long time, but all the photos show things that seem so familiar and just yesterday. Even in 2007, some people seemed to be out and about and looking at their phone screens. Wow, the old pictures of Olympic Donuts brought me memories from 7 years back. Already the building around the Donuts shop was covered in construction fence, but they were still selling donuts. 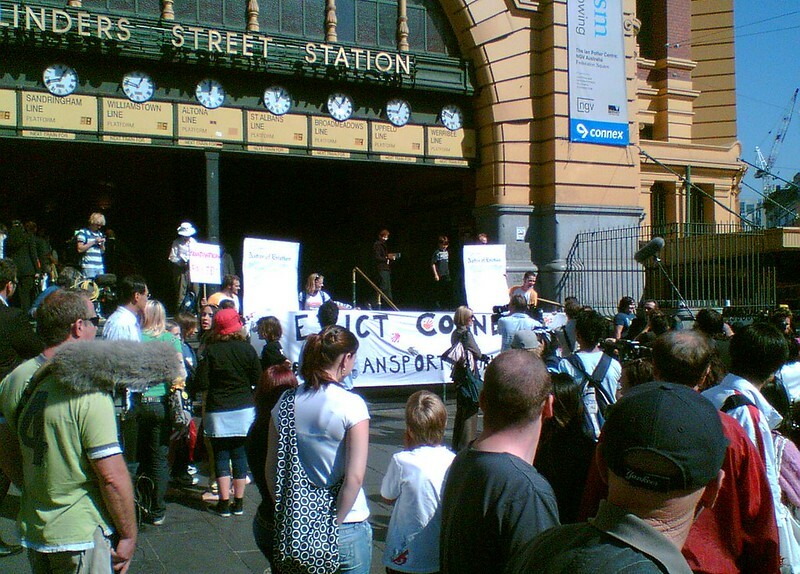 BTW, they are still doing free hugs at Bourke Street but I don’t see it all the time. Also, sorry, I meant to spell Doughnuts, but somehow a bit of Americanism overcame me.